Some immature cats display pronounced inflammation of the gums that has not spread to the back of the mouth called feline juvenile gingivitis. Causes may include exaggerated inflammation at the time of tooth eruption, viral exposure (FeLV, FIV, Calici), immune-mediated disorders, or mixture of reasons. If the oral inflammation can be controlled and kept controlled until adulthood, recurrence may be decreased or prevented altogether. On the other hand, juvenile cats with this form of oral inflammation who are not treated aggressively at a young age frequently suffer from the adult form of stomatitis. Most patients with these symptoms require detailed oral and dental assessment under anesthesia with dental x-rays. Meticulous dental cleaning should also be performed. 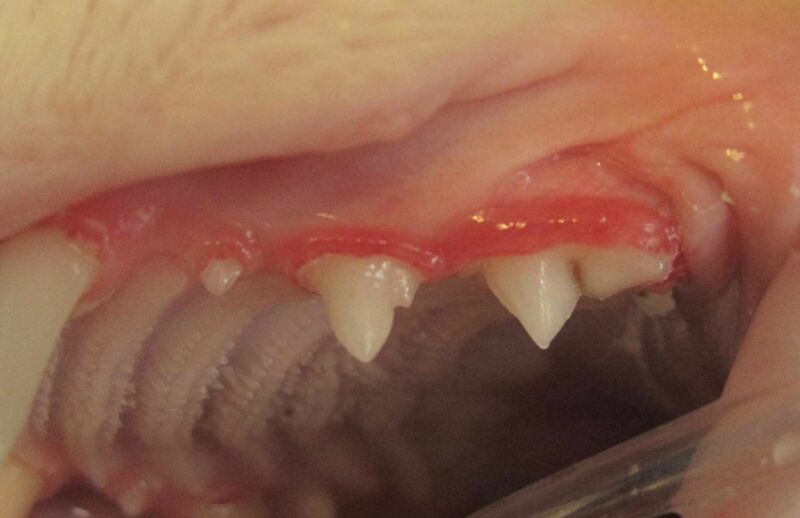 In applicable cases, extraction of persistent deciduous (baby) teeth may be necessary. In some cases, concurrent administration of feline omega interferon (Virbagen™) may help gain control. Dental homecare should also be initiated as soon as possble. Repeat dental cleaning may be required every 3 months until adulthood is reached or the inflammation subsides.